Beaded drape gown, by Gaurav Gupta, New Delhi. Emerald and diamond choker in 18-k gold, spiral diamond ring in 18-k gold, both from Jaipur Jewels, Mumbai. 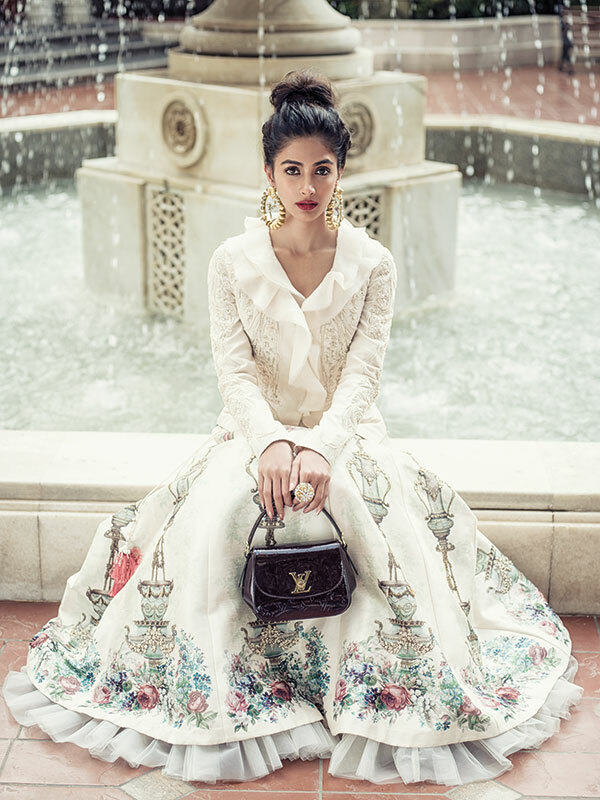 The Venetian chandeliers, marble staircases and princely decor at the ITC Grand Central envelop Pooja Hegde, as she gracefully drifts in for her last shot. This seems like a welcome change from the now-infamous headgear (also referred to as an ‘aviary’ by one of the Indian dailies) that she had been sporting for her Bollywood debut — Mohenjo Daro. Sans the drama and needless burden, her movements seem effortless and the heavily embroidered lehnga, feather-light. She throws sultry glances at the camera, takes quick breaks to make sure the hair and make-up is on point, and shares suggestions without being overbearing or obtrusive. On wrapping up, she smoothly transitions into a monochrome shirt dress paired with smart brogues. “I think I’m ready,” she proclaims to no one in particular, as we proceed to a master suite — the allotted setting for today’s interview. The excitement for her first cover does not go unnoticed. Pleated skirt (worn underneath), from Bodice, New Delhi. White gown with appliqué detail, from Karleo; fine-carved gomedak and polki earring in 22-k gold, statement polki bangle in 22-k gold, diamond bangles, all from Jaipur Jewels; Victoire bag in Monogram Canvas Raisin, from Louis Vuitton. All in Mumbai. She finds herself a suitable spot near the floor-to-ceiling glass window, and opens a box of freshly cut fruit. “This is my secret to regaining energy,” she says to her audience. Just then the ITC staff saunters in with a grand food platter that she generously distributes among the crew members. After all, croissants and sandwiches don’t a toned body make. A few minutes into the conversation, she scrambles for the phone and excuses herself to quickly plan a movie screening (the third in a span of two days) — this one with another set of friends. “You won’t believe it, most of my close friends took a holiday from work just to catch the first day, first show of my film,” she animatedly explains. Mint green silver dori lehnga, organza cape and gold-embellished choli, all by Anamika Khanna, Kolkata. Antique neckpiece with blue meena strung with pearls, Basra pearl Gajra bangle in 22-k gold, both from Jaipur Jewels, Mumbai. Satin bralet, lace skirt, both by Varun Bahl, New Delhi. Wool coat, from Dior; spinel ruby and diamond necklace in 18-k white gold, diamond parrot necklace strung in emerald beads in 18-k white gold, both from Jaipur Jewels; Bisten small suitcase in Monogram Canvas, Alzer 80 suitcase in Monogram Canvas, both from Louis Vuitton. All in Mumbai. Embroidered bralet, by Anamika Khanna, Kolkata. Custom-made slip dress, embroidered net veil, both by Nachiket Barve; antique jadau choker with Basra pearls, emerald and pearl Saathlada in 22-k gold, both from Jaipur Jewels. Both in Mumbai. The 2009 pageant didn’t take her as far as she had hoped. The then 18-year-old once again enrolled herself for Miss India South in 2010. “I’ve learnt that sometimes you’re so scared of trying because you don’t want to mess up. This time, I wasn’t afraid of dreaming big.” The final round at the 2010 pageant saw Hegde in her element. When asked to choose between career and family, she was the only one out of the five finalists to opt for the latter. ‘My family members are my roots and I wouldn’t want to chop them off’ was the sentimental answer that allotted her the title of second runner-up. At this point, an uncontainable enthusiasm begins to leap out of her well-poised frame. I’m not surprised when a Bollywood hair flip randomly finds its way into this conversation. Her demeanour is playful now, as she walks around stretching her limber silhouette. The room is buzzing with parallel conversations — her crew munching on the food platter, and an occasional chuckle from her brother who, I realise, has been eavesdropping. Slightly conscious now, she begins to field my questions with care. Did she always want to be an actor? “I was always a lost child. When people asked my brother what he wanted to be, he would always say that he wanted to be a doctor! And I used to ask him, ‘How do you know that?’ Because I just never knew!” Unimpressed by a nine-to-five desk job, she had almost enrolled into a fashion design institute. Just then, Miss India happened, and steered her into the film industry, bagging a Tamil feature and two Telugu films. Besides Mohenjo Daro, you can also spot her in some commercials including the Hero Maestro one with Ranbir Kapoor (where yet another actor took up most of the screen space). Embroidered coat with ruffles, by Gaurav Gupta; printed lehnga, by Varun Bahl. Both in New Delhi. Antique gold and Basra pearl earrings, diamond cocktail ring in 18-k gold, both from Jaipur Jewels; Pasadena bag in Monogram Vernis, from Louis Vuitton. Both in Mumbai. We move on to explore the guarded territory of many a star — love and relationships. She dismisses my very first question of describing her first date. Wary of controversies, the doe-eyed actress finally agrees to divulge a few details. “My first crush was on my technical drawing teacher. He had participated in a male model hunt and everyone had the hots for him.” It’s no surprise that I got 97 on 100 in that subject! Just then the stylist, who also happens to be in earshot, quips, “Hey, I know him too!” Caught completely off guard, this could have been a worrisome moment for many, but Hegde simply joins the mini discussion. On the verge of completing 26 years next month, the young girl’s ideas on boyfriends and break-ups are brief, but relevant. She tells me straight up, “Break-ups can be good, because they make you stronger. I just think that if a guy really wants to, he will do anything to be with you.” The answers to all troubles seem to be her mother and chocolate. And if that doesn’t work, she dives into a bowl of ice cream and a platter of cupcakes. 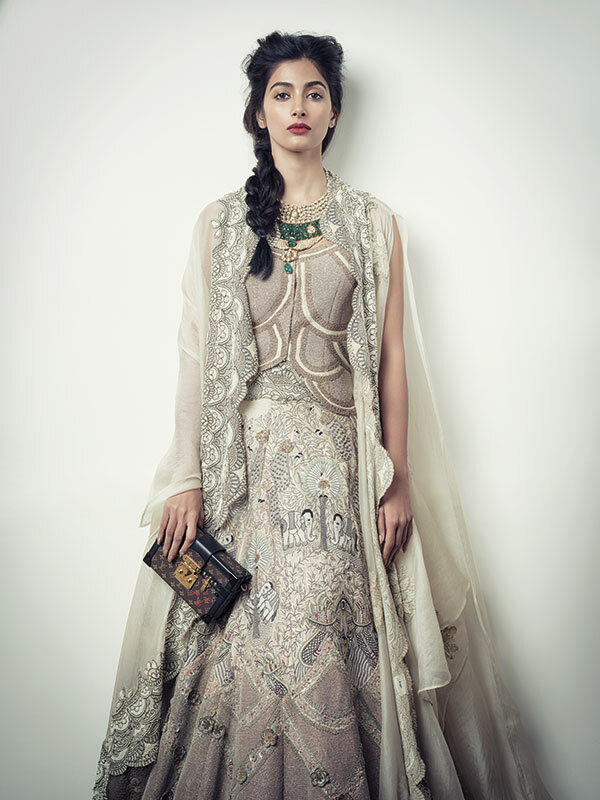 Ivory falisa lehnga, gold-embellished choli and organza cape, by Anamika Khanna, Kolkata. The Phoenix necklace crafted with polki and a 5-carat cabochon emerald, from Jaipur Jewels; Petite Malle bag in Monogram Canvas, from Louis Vuitton. Both in Mumbai. For a girl who has admitted to being an introvert, her bridal book is astonishingly elaborate. “My wedding will be a weeklong party. I don’t understand the idea of one really big celebration. I would want to be at an exotic location but with people who are closest to me. It should not be so big that the wedding becomes a task.” She fusses over the Victorian era and declares that she is in love with vintage settings. Also open to a ceremony in a palace in Udaipur, her favoured designers are Sabyasachi Mukherjee, Shantanu and Nikhil, and Anamika Khanna. 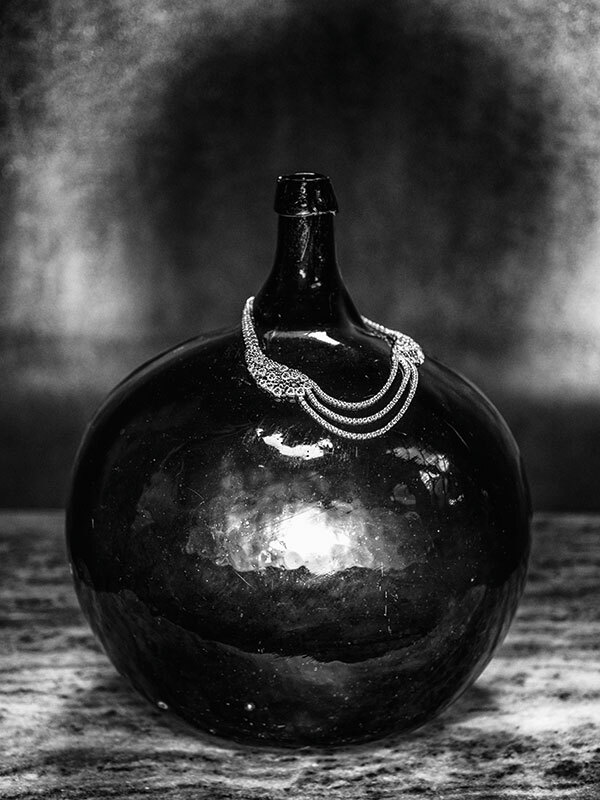 Emerald and diamond necklace in 18-k white gold, from Jaipur Jewels, Mumbai. Pearl-embellished blouse, by Varun Bahl, New Delhi. Textured organza lehnga by Anamika Khanna, Kolkata. Jadau haathphool in 22-k gold, from Jaipur Jewels, Mumbai. Is that her idea of the perfect life? “Well, ‘ideal’ doesn’t exist. That’s why there’s another word, which is ‘real’. I may want to be with someone who is supportive, loyal and humble. But at the end of the day, accepting the other person’s flaws is what makes a relationship. It is a lot of responsibility.” A quintessential answer that bursts the bubble; after all even Hegde knows that uneasy lies the head that wears a crown.